How do I find out if there's a judgment against me when I receive a collection lawsuit? 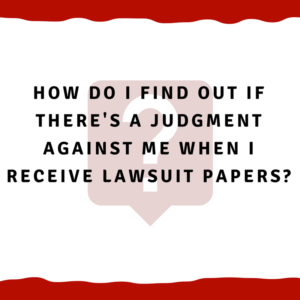 How do I find out if there’s a judgment against me when I receive lawsuit papers? How do I find out if there’s a judgment against me when I receive collection lawsuit papers? So you’ve been sued by a debt collector in Alabama, you’ve been served the lawsuit papers, but you’re wondering how you’ll know if there’s already a judgment against you. Let’s talk about a couple of things before we get to this. First, you have a certain amount of time to answer the collection lawsuit. If you’ve been sued in Small Claims or District court, you have 14 days to answer/respond to the lawsuit. If you’ve been sued in Circuit Court, then you have 30 days to respond. So if you’re still within those deadlines, then there shouldn’t be a judgment against you. You can still check with the court, or get in touch with our firm (1-205-879-2447), and see if there is a judgment against you. The key is to take action as soon as you know about your lawsuit. File a response as soon as possible. Whether you do it on your own, or you call a lawyer that knows what they’re doing, it’s crucial to face your case head-on. Unfortunately, if you don’t answer within the time limits, a default judgment will usually be entered against you. However, a default judgment isn’t always entered. We’ve had clients who were served 6-9 months ago, and they call us about their lawsuit. We look up their case and discover that they don’t have a default judgment against them. So then we file an answer immediately to avoid getting a default judgment. Whatever your situation is, give your local courthouse (or even us) a call and find out where you stand in your collection lawsuit. I cannot emphasize the importance of taking immediate action enough when you’re dealing with a debt collection lawsuit. File that answer as soon as possible. If you’re outside of the time limit, but you don’t have a default judgment against you yet, file that answer and respond to the lawsuit ASAP. There’s a small window of time where you can undo a judgment if you’ve been properly served, but you have to act quickly. It’s critical to your success in your collection lawsuit. So if you’ve got a lawsuit sitting on your kitchen table and you haven’t looked at it in a while, pick it up and figure out what you need to do with it. We would be glad to help in any way we can.